I must admit, I have been bitten by the blog bug. I love reading daily from the different bloggers who write on a variety of topics, from compassion to corporate social responsibility. One of the more intriguing blogs i presently read is the 5 dollar philanthropist. This is Tom William’s (co-founder of www.givemeaning.com) blog on social networks, marketing and philanthropy. The project GiveMeaning is a phenomenal site which helps connect communities and individuals to make positive change. Lastly, here is a list of communities that search for kindness. Note the hometown of the kindness crew, Victoria, B.C. in 3rd place! My name is Matt Navitsky and I’m getting in touch with Extreme Kindness on behalf of Circuit City’s firedog services. The “firedog Across America” contest was launched by Circuit City this past winter to donate hundreds of thousands of dollars to America’s firefighters. Now we need help selecting the $100,000 grand prize winner. On top of that, every vote cast will result in a $1 donation to the voter’s chosen firehouse. We’d be thrilled if you could let Extreme Kindness readers know about the contest so they can help raise money for America’s fire safety professionals. Now that the ten finalists have been selected, we need everyone’s help deciding who the grand prize winner will be. Each of the ten finalist firehouses will receive $20,000 for much-needed equipment and the corresponding essay writer will receive a home “techover” worth $10,000, courtesy of Circuit City’s firedog(SM) services team. And as a firedog Across America finalist, these ten firehouses are now eligible to win additional funding during this final stage of the campaign when America votes for a $100,000 grand prize winner. Until May 13, Americans can visit firedog.com to view all ten firehouse finalists’ stories (also pasted below this email) and vote for their favorite. Each vote will result in a donation of $1 to the voter’s chosen firehouse. At the culmination of the voting stage, the firehouse with the most votes will win the grand prize. The winner will be announced the week of May 14, 2007. Circuit City developed firedog across America to kick off its new service, firedog, a one-stop shop for consumers’ technology needs: firedog.com. Circuit City’s firedog technicians install, optimize, repair, and make technology purchases simple so consumers don’t have to waste time with piles of manuals and tricky cables. As part of the December launch, Circuit City and firedog also presented $100,000 donations to both the FDNY Foundation, which supports New York City Fire Department initiatives, and the National Law Enforcement and Firefighters Children’s Foundation for its efforts in helping children of law enforcement and firefighting personnel. Former New York Mayor Rudy Giuliani and New York City Fire Commissioner Nicholas Scoppetta were on hand to receive the donations. Again, we wanted to share information about the firedog Across America contest with Extreme Kindness in hopes that you’d let your readers know about it and help us honor and generate donations for America’s fire safety community. I’ve included the list of ten finalist firehouses below. Please let me know if you decide to encourage your readers to vote for their favorite at firedog.com or if I can provide you with further information. Ever found yourself seething because you can’t find your keys, or you left a grocery bag at the store? I have…many times! It can be tough to stay centered, or positive when little stresses pile up in our lives, and it is important to have a system or a method for taking care of these stresses. Prevention of course is key: stay engaged in what you are doing, be patient in your work, take the time to put things in the same space all the time. Most of all: stay organized! These routines will help eliminate much of your distress before stress has the chance to surface. But, guess what, you will lose things! So here is a simple formula I have come up with to help me when my favorite dress shirt has walked away from my closet. 1. Choose to stay Positive through the process. 2. Begin to clean up the space you are looking in. This will allow you to feel productive during this process. 3. Set a time-specific goal. 4. Reward yourself when you find the item, and for cleaning up your space. The Get Things Done formula will also help you to stay organized and on top of your work and life. This will minimize most of these issues before they arise. Is it possible to forgive someone on-site, without receiving an apology or admission? Do the personal feelings associated with forgiveness always necessitate the apology of another? It may be possible to move towards resolution with those who have wronged us by first releasing our hurt or anger. This can allow us to be in a space of grace when we meet that person to search for our answers and apologies. We can release the burden of pain that often cripples us and plunges us deeper into the anxiety and pain which is connected to being hurt. I have begun to forgive on-site. Can you? The forigiveness project is a powerful and important project which brings together people to engage in the process of forgiveness. The website has a plethora of stories about forgiveness in the most extreme of situations. Richard St. John is a fellow Canadian, dedicated to spreading success and passion. In this three minute video, Richard, let’s us know how to achieve success in area of life. Two of his “8 Factors for Success” really stood out for me: Passion and Serve. These two pillars are what have driven the Extreme Kindness project. Pairing something you love to do with making a difference in the community is the main philosophy behind our work. Right now I am racing through the book this presentation is based on: Stupid, Ugly, Unlucky and Rich, What Really Leads to Success – and it’s not smarts, looks or luck. The book has a beautiful minimalist design and is filled with insightful quotations from the world’s most succesful, in all areas of life. Anyone wanting to find success in serving the community should consider this book! I believe that authenticity is a foundational aspect of being kind. In order to live in true compassion, we must be truthful in our words, action and emotions. Here, Robin Sharma, famed life coach and friend of the Kindness Crew speaks on this topic. How can we create a discipline for kindness in our life? No, I don’t mean a random act of spanking, I am interested in exploring how kindness can be a habit, an addiction that we just can’t quit. I believe like any other action we take, it must start with the intention or desire to do so. We must feel the need to get our fix of the helper’s high. We must believe there is a need to create more kindness in our lives and in the lives of others. Once we have realized this we can then start the planning. Just like building a house, we need to create a blueprint for ourselves of how we want to change our life. We can first look at where kindness is lacking in our lives. Is it with a person we are frustrated with, strangers in our community, or maybe it is our perceptions of other cultures? As we break ground we can begin to loosen the thoughts that are preventing us from setting an unstable foundation. Thought by thought we can build a healthier way of seeing the world: a world filled with positive people and opportunities to make someone’s day, and in turn improve our own. Once our new mental frame is complete, we can head outside and plant new expressions of compassion. Each day we can commit ourselves to one new act of kindness. We can write this commitment down, tell a friend our veritable pusher of goodwill to remind ourselves of our new habit! Beside my computer lies a set of cards, each one dedicated not to a sports player, but to a human virtue. They are titled, virtues cards. Linda Kavelin Popov created these cards as a response to the overwhelming negative forces shaping culture and society. They are only one of the tools developed under the Virtues Project, who’s mission is to provide empowering strategies that inspire the practice of virtues in everyday life. Today, the top card on the deck is assertiveness. The card reads, “being assertive means being positive and confident”. You are aware that you are a worthy person with your own special gifts. You think for yourself and express your own ideas. You know what you stand for and what you won’t stand for. You expect respect. Today I will look for ways to be assertive with myself. When I start to feel lethargic after working for hours at my desk, I will remember this card and draw strength from it. Each day, I cut this deck look for the queen of creativity, or the king of cooperation or the ace of assertiveness. I focus on the card for a few minutes, reflecting on how I can embody this card for the next 24 hours tomorrow, I will draw another. This task may seem very simple, and it is. There is power in simplicity, especially in connection to how we live our lives. If we can focus on how to make small, positive changes, they will eventually growth beyond our imagination. A few months ago, I had a personal “a-ha” moment in my musings of why it feels so good to give to others. The thought that I had was that basically the reason it feels good is because we remember the greater reality of our existence: we are all connected; we are all one. 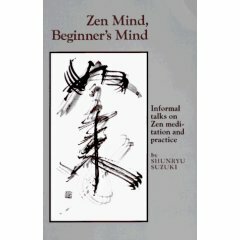 I found this quote today in Zen Mind, Beginner’s Mind – informal talks on Zen Meditation, and at it made me remember this simple maxim for my life.